In these modern times, a dirty fuel injector system is a common problem for vehicles. Most of the vehicles you see on the road today are electronic fuel injection systems, with the exception of the carbureted and direct injected vehicles. The electronic fuel injection systems distribute your engine’s fuel through an electronically controlled fuel injector system. Most injections work by spraying a fine and specific pattern of mist into your engine. This system is important for the correct and healthy operation of your vehicle’s engine. Over time, the nozzles that are spraying the fuel might become clogged and dirty from deposits that are found in your engine’s fuel. When the fuel injectors become clogged or too dirty, they will no longer distribute the fuel correctly, and this is going to make your engine’s performance less than satisfactory, and it could even cause some emissions problems. The usual symptoms you’d see of a dirty fuel injector is a decrease in miles per gallon and engine power, a rough idle, and cylinder misfires. In general, dirty fuel injectors can result in one or more codes that are going to cause your Check Engine Light to appear and cause your vehicle to fail the emissions test. This is where a fuel injector cleaning kit comes in handy, but which ones are the best ones to use, and how do you use one? First, you’re going to need an air compressor, hand tools, a fuel injection cleaning kit, and some safety glasses. You should thoroughly read the instructions for your kit before you use it. The first step to cleaning your injection system is to locate the connector. You can find where it’s located in your vehicle’s user manual, or look it up on the car manufacturer’s website. Second, you’re going to want to warm up your engine. Once you’ve found where you’ll connect the kit, start your vehicle and let it run until it’s at its normal operating temperature. Take note that some cleaning kits require the vehicle to be at a certain temperature, so be sure you read the instructions. Turn off your vehicle and disable your fuel pump. Then prepare the cleaning solution. If the cleaning kit doesn’t come filled with a solution, you’ll need to add your solution to the canister. Prepare the cleaning kit by connecting it to the engine with the hoses and fittings. For most kits, you’ll see the pressure and make adjustments as you need to. Step six, connect the cleaning kit. Connect the fuel system cleaning kit to the fuel system in your vehicle at the connector. If your vehicle doesn’t use a threaded fitting, take precaution when you’re alleviating the fuel pressure before you open up your system. Step seven is to attach the compressed air hose. The tool works by using the compressed air to power your kit and distribute the solution through the vehicle’s injection system. Match the pressure of the cleaning tool and your system. The pressure has to be equal so that when the valve opens, the solution flows through the same way the fuel normally would. Then, prepare to start the engine. 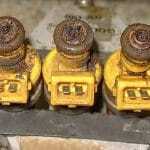 Once the regulator is at the right pressure, open the shut-off valve and start your engine. Run it for the specified period in the cleaning kit’s instructions. Turn off your vehicle and disconnect the kit. Then, reinstall your relay, and you’re finished! 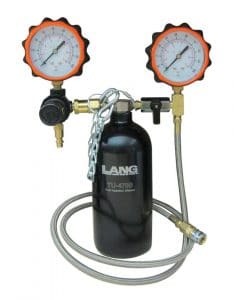 I like the Lang Tool TU-470B Fuel Injection Cleaner Kit because it cleans out the carbon from your intake valves, cylinders, and the fuel passages with a professional grade cleaning solution. I don’t have to worry about this solution ruining my engine or causing more harm than good. I personally believe this is one of the best kits out there because it helps restore the original spray pattern and boosts the performance of any vehicle I’ve tried it on, and it helped me pass the emissions test last year! The best thing about this kit is that it’s easy to use, and the gauges are accurate. If I can’t get ahold of my usual go-to product, I go for this one instead. This kit is designed with the professional in mind. It’s reliable, quick, and effective in cleaning out fuel injection systems. It’s a little trickier to use, though, with its special solvents and the compressed air, but that’s what makes it extremely effective. It also comes with its own gauges that I’ve found to be pretty accurate. In a pinch, I’ve used this system before for my vehicles. It does improve the vehicle’s mileage performance and definitely does its job cleaning the intake valves, fuel injectors, and fuel passages. It has an easy to connect hose with many different adapters so that you can find the right one for your vehicle. The only downside is that it only fits up to eighty percent of foreign and domestic vehicles. Therefore, there is a chance it might not work for yours. The plus about this kit is you can use it with gasoline and diesel engines, so you don’t have to worry about which type of fuel your vehicle uses. You just add eighteen ounces of your favorite cleaning solution, hook it up, and give it a go! This kit cleans much better than the aerosol methods when it’s used with the right solvents. 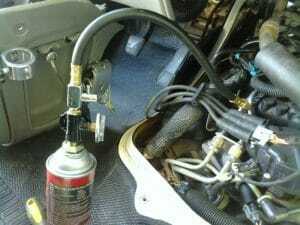 It will connect directly to the shop air supply, and includes the gauge hose and the instructions, so you’ll know what to do! 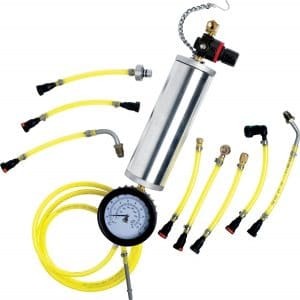 This system works best with all OTC fuel injection system adapters and has a lifetime warranty. The warranty is my favorite part! 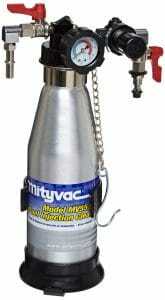 This cleaning canister is designed for the injection cleaning and direct rail cleaning. It works by loosening or dissolving, and then combusting, any debris that’s in your system. Anything found in the system is ultimately removed from the exhaust system of your vehicle. This cylinder has a twenty-two-ounce capacity and is machined from stainless steel, so it’s very durable. 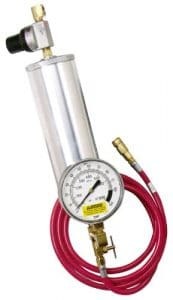 It’s also able to handle pressures up to 30,000 PSI, so you know it’s a quality product. I really enjoy using this canister because it has some nifty features thought up for the average mechanic. It has a spill-proof full-size cap that makes adding the solvents easy and has a 3.5” gauge that makes setting your outlet pressure easy and accurate. To use these systems, you just hook them up to your fuel injection system, a shop air source, and make sure you add the correct solvent. Just be sure you look for the proper adapters for your vehicle as every manufacturer is different.